The phenomenon of confirmation covers a wide range of definitions. In personal or professional life, the decision making is applied after the fact of confirmation. Once, anything is decided or any work has to start, it is always confirmed before final completion. Once, some new plan is launched in an industry, the working is checked and confirmed before finalizing. In the computer system, all applications to be downloaded are being started after confirmation. The ATM machines also confirm before final decision to bring the cashout. Working voluntarily is a great source to acquire knowledge and skills. It is also a remarkable help to all the NGO’s, especially which are serving humanity. Variety of learning can be done while working voluntarily. It also serves as a motivation. Working voluntarily gives the experience which is very useful while applying for a job. Volunteers are usually non-paid and are under no obligations as they are working solely with their own consent. But the skills and experience gained at the time can be used while applying for a job. 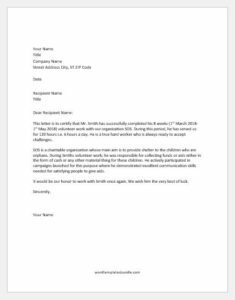 While applying for a job, a person can request a volunteer confirmation letter. 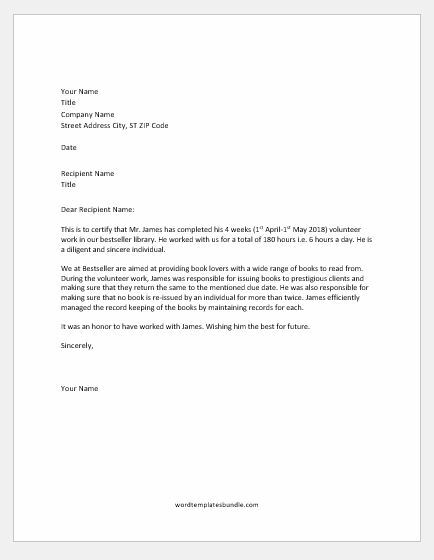 He/she can request for the letter from the company or organization where they served. 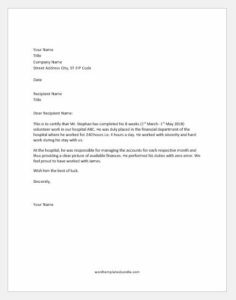 Such letter contains all the useful information one can utilize for getting a job. This letter can also be assumed as a certification of qualities, skills, and capabilities. The time period, the details of the specific job and responsibilities performed are also to be mentioned. 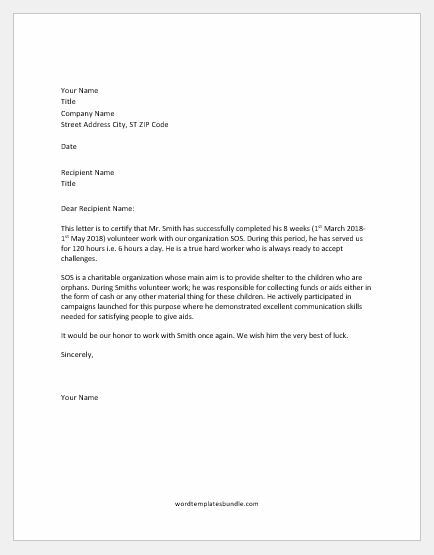 This letter is to certify that Mr. Smith has successfully completed his 8 weeks (1st March 2018-1st May 2018) volunteer work with our organization SOS. During this period, he has served us for 120 hours i.e. 6 hours a day. He is a true hard worker who is always ready to accept challenges. SOS is a charitable organization whose main aim is to provide shelter to the children who are orphans. During Smiths volunteer work; he was responsible for collecting funds or aids either in the form of cash or any other material thing for these children. He actively participated in campaigns launched for this purpose where he demonstrated excellent communication skills needed for satisfying people to give aids. It would be our honor to work with Smith once again. We wish him the very best of luck. 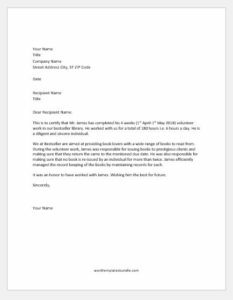 This is to certify that Mr. James has completed his 4 weeks (1st April-1st May 2018) volunteer work in our bestseller library. He worked with us for a total of 180 hours i.e. 6 hours a day. He is a diligent and sincere individual. We at Bestseller are aimed at providing book lovers with a wide range of books to read from. During the volunteer work, James was responsible for issuing books to prestigious clients and making sure that they return the same to the mentioned due date. He was also responsible for making sure that no book is re-issued by an individual for more than twice. James efficiently managed the record keeping of the books by maintaining records for each. It was an honor to have worked with James. Wishing him the best for future. This is to certify that Mr. Stephan has completed his 8 weeks (1st March -1st May 2018) volunteer work in our hospital ABC. He was duly placed in the financial department of the hospital where he worked for 240 hours i.e. 4 hours a day. He worked with sincerity and hard work during his stay with us. At the hospital, he was responsible for managing the accounts for each respective month and thus providing a clear picture of available finances. He performed his duties with zero error. We feel proud to have worked with James.